When I was 14, I went on an exchange trip to Germany with my high school band. It was a strange time for me, in which I got in a car accident, discovered bathrooms with heated floors, was disgusted with my classmates for going to McDonald’s instead of eating local cuisine, and missed out on drinking beer because no one wanted to hang out with the snotty girl who looked down on people who ate at McDonald’s instead of sampling the local cuisine. The undoubted highlight, though, was the trip to Neuschwanstein. Not so much because of the castle — though I remember it being pretty — but because on a low rock wall near where we sat to eat our lunches I spotted a strange little bird, a bit like a nuthatch but largely dark gray with vivid red wing-markings. It wasn’t until I got home and had access to a library that I learned that I’d seen a Wallcreeper. Structurally, this is one of the most traditional, even basic, of nature documentaries — the story arc is the cycle of the Wallcreeper’s year, from the spring return to the rugged cliff faces through courting, nesting, rearing of the young, fledging, and migration, with challenges arising from predators and from the need to find food, with each step laid out briefly in its basics. The pacing is staid, and surprises are few. Rather, the film’s virtues are located in the sheer beauty of some of the shots, not only of the photogenic main subject but of all manner of mountain birds and animals, and of the landscape itself. Even silverfish grow visually interesting as presented here. No blockbuster, this. 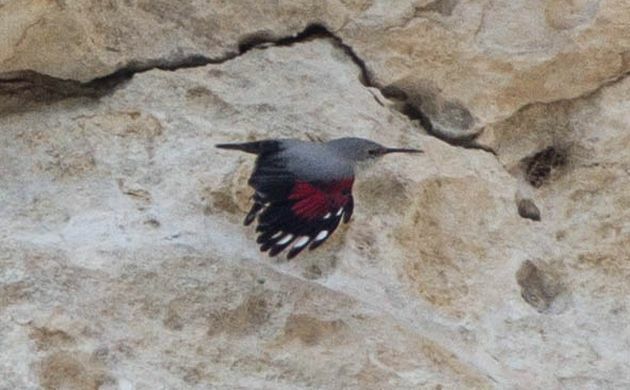 But it is certainly a charming diversion for a laid-back evening at home, and likely to bring a smile to the face of anyone who has had the pleasure of meeting the Wallcreeper in real life. Featured image by Ron Knight. You have a wonderful sight. I’m liking it on Facebook to share with my friends who enjoy nature photography. Beautiful pictures. I’m currently living in Germany and Wallcreeper, along with Capercaillie, are high on my most wanted list. Hi Tim, I’m very curious to whether you saw your Wallcreeper and Capercaillie in Germany after all… Please tell ! I have wanted to film Wallcreeper for years, so I will be very excited to see this, if possible. I think you should also inform your readers as to where this is available and in which formats. DVD? Blu-ray? Netflix etc.. Thanks for the review . If you click through to the film’s website, you can order it on DVD. Hope you enjoy it. FWIW, Carrie, I would also have turned my teenaged nose up at McDonald’s (said the gal who, cough, succumbed on her third night in Rome). Lucky you to have such a wonderful encounter with a marvelous bird! Birding At Work With Non Birding Coworkers. Man Saves Falcon from Pigeons?! ?